Last weekend at Germantown City Hall, YahNe Baker and The Think Tank convened a conversation to explore different models of and approaches to learning, with a particular emphasis on what might be possible in Germantown. The Philadelphia School District is in a moment of extreme crisis because of the so-called “doomsday” budget, which has resulted in thousands of teacher and staff lay-offs and has come on the heels of the closure of 24 schools (Germantown High School is one of these and is located across the street from the town hall building). Most Philadelphians have strong opinions about the disastrous state of public education and what steps should be taken to rectify the current situation. A young teacher-in-training is interested in organizing a professional association of public school teachers who are displeased with the current dominant model of schooling in order to envision new models from the inside out. A mother of a young girl in a local public elementary school expressed her frustration at the toxic environment in which her daughter is enrolled, which includes abusive and burnt-out teachers and teacher’s aides and tired, disinvested parents. A community activist, author, and mother from West Philadelphia shared about her research into the cultural dynamics of parenting and discipline within the African American community, and how this impacts perceptions and practices within the space of education. YahNe told us about the struggle to seek out the best education for her teenage daughter, which has included a range of experiences in private schools, public schools, and, soon, homeschooling and cyber school. Meredith and I shared some basic information and resources on unschooling and other alternative educational models (including Think Tank Reader Vol. III). I spoke about the dilemma we face in wanting to unschool our own children while at the same time building broader support for others in our community who might be interested in this approach for their kids but unaware or unable to envision how that might happen. In the end, the conversation circled around two related long-term objectives focused on Germantown: 1) providing resources and support for others in the community who might want to pursue alternatives to schooling (public or private) for their children; and 2) building community support for neighborhood public schools. 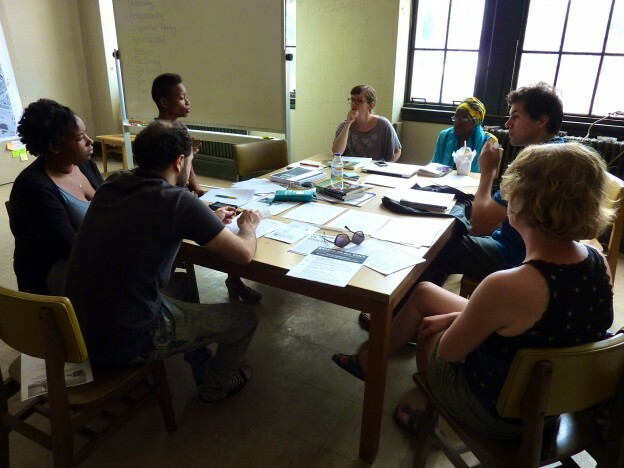 The participants on this day made a tentative plan to organize a larger community meeting on education in Germantown later in the summer to explore concrete actions in advance of these goals. This entry was posted in Notes and tagged community, conversation, education, GCH, germantown, pedagogy, philadelphia, structures_of_support on June 16, 2013 by Jeremy. 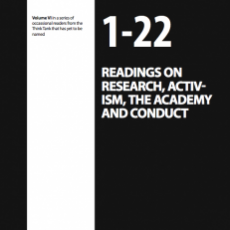 22 Readings on Research, Activism, the Academy, and Conduct is Volume VI in the Think Tank’s reader series. Developed by Heath Schultz and Katie Hargrave in May 2010 for Open Engagement: Making Things, Making Things Better, Making Things Worse, the reader explores how to conduct research and deploy it in the world. 22 Readings on Research, Activism, the Academy and Conduct is part of an occasional series of educational readers by the Think Tank that has yet to be named. This reader was created as part of the conference Open Engagement: Making Things, Making Things Better, Making Things Worse. In compiling this reader we are interested in what it means to research and how to implement that research in a socio-political context. How does one breech the barriers that render theoretical inquiry and expression useless? What is the role of the student? What is the role of the intellectual? What might the researcher look like or create if she exists outside the academy? How are we implicated in activist projects and communities? We are interested in thinking through what it means to embody research and produce affective action in its wake. This entry was posted in Projects, Readers and tagged activism, education, pedagogy, readers on May 11, 2010 by admin. 30 Readings on Neutrality as it relates to Art, Politics, Biology, and Space, Volume V in the Think Tank's reader series, was a part of “Public Things” at Analix Forever in Geneva, Switzerland. The texts explore the notion of neutrality within the context of Switzerland’s political neutrality. This reader was created in March 2010 by Katie Hargrave, Meredith Warner, and Heath Schultz. 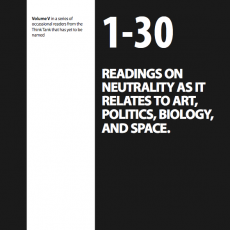 Volume V, 30 Readings on Neutrality as it relates to Art, Politics, Biology and Space, is part of an occasional series of educational readers by the Think Tank that has yet to be named. 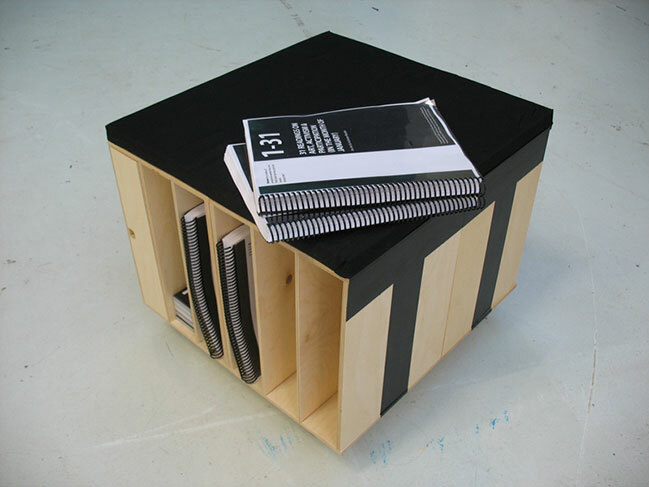 This reader was created in conjunction with Prototype for a Pedagogical Furniture II to contain and present Reader V and a PHPM (Publicly Held Private Meeting) Instructional Pamphlet. As a prototype, this piece is the second iteration of small-scale, mobile furniture which might be deployed in various contexts to assist in educational and dialogical projects. In this version, we included a reader on neutrality as well as an instructional manual on how one might conduct a PHPM (Publicly Held Private Meeting). This gesture was intended to encourage the viewer to use the mobile unit to facilitate his or her own Publicly Held Private Meeting in Geneva, Switzerland, a neutral state. This entry was posted in Projects, Readers and tagged art, biology, education, PHPM, politics, readers, urbanism on February 25, 2010 by admin. 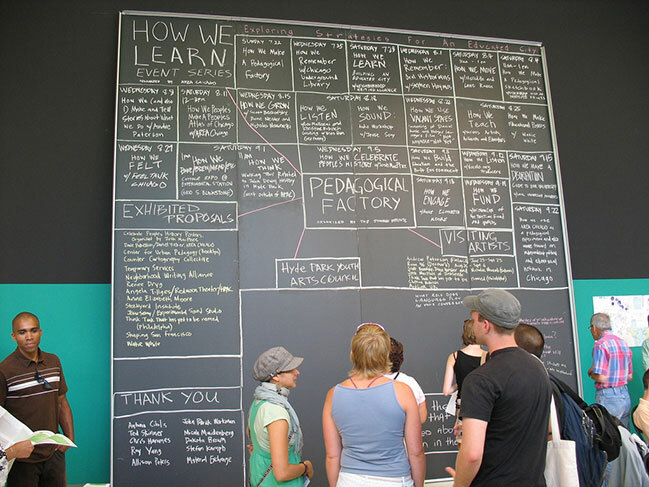 Radical Orations on Art, Activism, and Education was developed in April 2008 following an online conversation about our experiences as artists, activists, and educators. Participants included Heath Schultz, Meredith Warner, Jeremy Beaudry, and Katie Hargrave. As part of an ongoing conversation on art, activism, and education, we present documentation of radical educational texts broadcast throughout Philadelphia, Boston, and Chicago in the style of public orations. The orations are sited in the location of each individual participant, documented, combined, and distributed in this pamphlet. Radical Orations on Art, Activism & Education was publicly presented by the Bureau of Open Culture in its Agency for Small Claims series of exhibitions during August and September of 2009. The live interventions draw on the history of the street corner soapbox as a form of sited, distributable education. The documentation presented here intends to combine the temporal, performative, educational, and site-specific nature of the project into a (re)distributable form. In particular, the remixing of the audio documentation is an assemblage of the orations in content and context. This editing down attempts to create connections between both the content of the radical educational texts and the ambient aural experience of the three distinct urban locations where the oration occurred. Also important here is the prelude conversation that led us to this experimental project. This ongoing conversation is as important as this project. As you will see from our conversation, we believe our learning process is integral in a continual praxis dedicated to emancipatory education, critical discourse, and strategies for resistance. This entry was posted in Projects and tagged activism, art, education, performance on April 8, 2008 by admin. 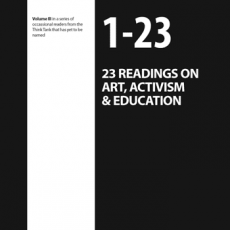 23 Readings on Art, Activism and Education was developed as Volume III of the Think Tank's reader series in April 2008. It was created in conjuction with the Radical Orations project as a way to further explore the spaces between art, activism, and education. This reader was created by Heath Schultz, Meredith Warner, Jeremy Beaudry, and Katie Hargrave. 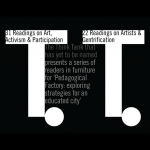 This reader was created in conjunction with Radical Orations on Art, Activism & Education, and established a baseline of research interrogating the relationship between art, activism, and education according to contemporary and historical perspectives. As important was an initial email exchange which set the terms of the reader and the subsequent Radical Orations project. This preliminary conversation gives some insight into a collective learning process that is dedicated to emancipatory education, critical discourse, and strategies for resistance. This project was publicly presented by the Bureau of Open Culture in its Agency for Small Claims series of exhibitions during August and September of 2009. This entry was posted in Projects, Readers and tagged activism, art, education, politics, readers on April 7, 2008 by admin. The following email exchange is a conversation between Meredith Warner, Jeremy Beaudry, and Heath Schultz from November 2007. The subject matter covered art, activism, and education, and many of the ideas that informed the genesis of the Think Tank were presented. The exchange also served as important preliminary thinking for both Volume III of the Think Tank's reader series as well as the Radical Orations project. I just finished reading this book on Anachist motivated education called “The Modern School Movement: Anarchism and Education in the US” by Paul Avrich. I was talking to Aaron about it and how it was pretty rad and he mentioned that you guys were also really interested in some of the same ideas (alternative education, “freedom schools”, etc). I often think about how art + education + activism can be merged together, but haven’t really found others having that conversation. It seems there are many talking about art and activism, and often times using methods that might be similar to those of educators, but previous to the pedagogical factory i’ve never heard them talked about in the same breath. It certainly seems to be becoming more hip, more and more I hear of artists citing freire, but I’m yet to really find someone who is attempting to articulate how we can use all three effectively as one. I suspect by your practice and work with the Think Tank you think about art/activisms relationship to education (and I don’t necessarily mean “art education”). More and more I’ve been thinking about these types of practices that attempt to implement some kind of educational tactics as a way of communicating. I don’t know if I have specific questions about these types of practices (I guess I’m referring to work that was included in the pedagogical factory and other similar practices), but I wonder what your thoughts our about attempting to cram together art/activism/eduation all into one? Is the collective/think tank model a way of educating ourselves so that we might move forward, or shake the foundation of three fields? and how is that related to more traditional forms of education? I’m probably revealing my ignorance on the subject, but I guess that’s why I’m writing. I feel that this is an important discourse and I’d like to know what you guys think, or if you have any suggestions about where the a more complicated conversation may be happening. So far I’ve been reading stuff from all three angles, and they often seem to overlap, but never quite merge completely. Hopefully this isn’t too far out of left field. Hope all is well with both of you! Look forward to hearing from you soon! Good to hear from you. Yes, Jeremy and I have been considering the conflux of art, activism and education for some time — though we are far from coming to any kind of a conclusion. I have attached a link for a writing that [DIM] and I produced a few weeks ago for a listserv called Empyre — http://www.wearethethinktank.org/wp/2007/10/critical-spatial-practice-view. The list tends to be dominated by those who are densely theoretical, and few who practice — which seems common in these spheres. Regardless, after a month long web discussion about “critical spatial practice” KH asked DIM and I to contribute. We set out to talk about our experiences in Philly as artists and activists and the occasional convergence of the two. I think for a long time we had been also thinking about how to meld these two disparate practices. What came clear to us through the writing was a suggestion that perhaps this fusion was not necessary, but that our practices as artists and activists were two parallel practices that served to inform one another — as a way of grounding them, invigorating them and looking critically at them. And I think that is how we envision our Directorships within the think tank. As far as the educational aspect, we are both very committed to teaching. I think we have both really thought of our educational practice as complimentary, and necessary to our work as artists. So again, everything intertwines and informs. Academia is the prize — the coveted tenure track job — right? But is there an educational model that lives outside of the institution? What we have not talked specifically about is what an alternative model would look like — internet based, free, socially engaged– or rather is it the creation of a model of self-education? With the readers, with pedagogical factory — I think we were thinking about how to make pointed, condensed, specific information available to people — perhaps even in a way that is instructional. Not to say that the reader is a “How to,” but that they provide a broad base of theory about the subject so that one might find themselves informed as they enter into their own artist/activist practices. They are kind of like free, hyper-specific text books. In fact, I was hoping to get started on volume three soon — perhaps it should be about alternative educational systems, art and activism? And perhaps you would like to help compile the texts, especially since it seems you are already doing that? Of course, you would have to declare your Directorship! This week at Artivistic, I think I certainly saw more people whose work fell somewhere in between art and activism — but one of those distinct practices always seemed to dominate in the work. So I guess at this point I wonder if they can or should meld. When I think about the convergence of the three, adding activism, I think about how we could use an educational model to distribute the idea of the parallel practice. That a creative practice informs and activist practice, and an activist practice informs a creative practice. For me, this has been the more successful model so far. But I still have a hard time envisioning a form, a container for this whole thing… what ever it is? This is all very much on the surface for me right now– and I thank you for giving me a reason to write some of it down. I have a suggestion: Perhaps we begin to gather and share text on delicious under the tag “reader3″ pertaining to alternative models of education (actually, I started this a few weeks ago under the tag Ed_Model, if you want to have a look). Non-internet texts can be scanned and distributed in PDF form. Interested? thanks for responding. I found many of the things you said to be helpful, and if nothing else I’m always interested in how others view these problems. You’re e-mail made me think of a few things, many of which I was probably already sort of thinking about. I wonder about the sort of default “alternative education” practice which is the free school or freedom school, or simple group of people meeting outside of the institution. While I’m totally supportive (I’m certainly not making a case that many of these programs don’t teach essential critical thought, that I imagine is difficult with NCLB, and state mandated textbooks, etc. etc.) and find these type of projects really exciting — I wonder if their effectiveness is all that it could be if a more creative approach was implemented. I guess in some ways I’m making the same critique of alternative education that I am of art or activism, which is that I think we could use a totally new, progressive, and creative form to push the field in a new direction and shake it up — this is sort of the case that Duncombe made in DREAM, though it was more entangled with “spectacle” and politics, but I suppose that isn’t too far off here… I’m also interested in broadening how we think about education. I think the pedagogical factory did this, and I think the way you talk about the TT is more in line with what I sort of imagine a possible alternative art/education/activism looking like. Obviously I’ve also been thinking about whether or not these practices can or should be merged — you mentioned they were parallel and informative to one another. This I certainly agree with, and I don’t think it is a counter-productive model by any means. Perhaps I’m hesitant to let go of the idea that it is one of the goals to successfully merge the 2 or 3 disciplines because we, or at least I, simply like them so maybe I think just desire to see them collapse into one, and this obviously doesn’t mean its necessarily a good idea — maybe it is naive, problematic, or just not that helpful. But one big question does come up for me — if we could imagine a container or forum for this practice, that we have yet to really define, but one that successfully merges 3 disciplines while simultaneously creating something new, are we also destabilizing and invigorating all three practices in a helpful way? Are we providing a new, more beneficial model for art / activism / and education to be implemented in ways that are right now unimagined but ultimately would free up all three practices and perhaps liberate them (at least a little bit) from the institution? — And this is not meant as an attack on academia, but (obviously) if we could loosen the stranglehold that institutions have on all three disciplines it would be helpful for those who do not have access to them, although maybe that is a bigger problem that isn’t the point here. Hopefully that thought / question makes sense. I’d love to help compile some text for a reader one alternative ed. models! You’re right, I’m sort of already compiling some of these texts, but it’ll be good to take it a little bit more seriously now. I’ll start to pay a little more attention to some of these texts I come across and share them with you guys, and I’ll try and scan in a few things I’ve read recently that sort of energized these questions for me. I also noticed you tagged a bunch of freire books on goodreads, and I wanted to make sure you knew about this other book. It’s a book compiled of conversations between paulo freire and miles horton (the guy who started freedom school in Appalachia during the civil rights movement) appropriately titled “We make the road by walking”. I probably should take another look at it, I read it a few months ago and remember that they attempted to answer some of these questions also. Thanks again for responding, I’m excited by this conversation and look forward to continuing it with you guys! What happens in the think tank is that we try to ascribe form to a particular practice — which is what I think you seem to be interested in doing. An Example: having a dialogue about a site of contention, at the very site of contention, is a form that the Directors call a publicly held private meeting (PHPM.) What you are talking about in the quote above, nearly precisely, is what we Directors recently determined was the “space in between” (this was central to my presentation at artivistic.) Like the name, “the think tank that has yet to be named,” we have assigned the intersection of parallel practices with a name that is maliable for the user, or Director. The space in between, in our experience, has provided a location where these practices meet, but do not congeal into anything solid. And the reason for why we have chosen to create maliable, almost liquid forms, is to avoid co-optation, branding or consumption. It is to borrow from Bey, from the temporary autonomous zone. The Directors attempt to create distributable, usable forms that negate co-optation by the institution. The danger for instance: Collaborative practices, now all the rage, have only recently found their way into larger, economically driven institutions. What will happen to the practice of collaboration, a practice that was born out of the want to negate consumption, when it is made a commodity? (I am making some sweeping generalizations here, as you will learn I often do, but i think you know what I mean.) Directors attempt to create forms that make space in the world, forms that others can understand and borrow, forms that are there, then gone. The space in between the directors is the think tank. The space in between our parallel practices (art, activism, education) is the un-named, unbranded site of convergence — another space in between. As a Director (which you have yet to self-appoint), you have the autonomy to name that form if you choose — or to use the form by creating space for the form with out naming it. So, what is education? And, what is education for? I recently brought out a graduate thesis written by my grad school colleague, Hillary Procknow, who was trying to plot an alternative ethics for education (at the time, it was applied to architectural education, but really only superficially). She and I shared a mentor (Steve Ross) who brought us along the critical theory / Hakim Bey route towards an understanding of critical consciousness. Her writing starts out with an account and critique of the scientific revolution, then moves through critical theory / dialectical thought (Marx and Hegel), and on into “critical pedagogy”; finally, ending with something called the “ethics of the self” as new tactic in education. I need to revisit the writing more closely, but her work lives in the same area where we are thinking about this stuff. I’m going to contact her and see what she’s up to, ask her for any updated texts and references, maybe engage her in some of this dialogue. I think Hillary’s research probably was primarily focused on traditional educational structures (ie. the “classroom”), but at the time she was probably invested in working within institutions (not sure what she’s up to these days, though). Where art/activism/education intersect suggests to me a productive, critical, exciting way around of this — much like many of the alternative schools are trying. Maybe I hadn’t considered before your e-mail. But the TT might be entirely about educational tactics. I think we want to affect change, we want to empower people, we want to reveal their latent powers of agency, their individual critical consciousness. And not by telling them in some sort of patriarchal approach, but rather through a dialogical project in which we are all changed together. Yes, let’s get a reader going! Yes, let’s start planning an art/activism/education summit in Philadelphia for this summer! ps. What do you guys think about publishing this great conversation in the TT web site? You’re absolutely right, what I’m describing is the “space between” I feel like somewhere in this space there is room for us to really create exciting, important work. Perhaps my struggle with these ideas so far is that I’ve been desperately trying to grab hold of something solid, or some language and hasn’t quite been established yet. This seems contradictory to what you’re saying, which is that there isn’t (and shouldn’t be) a language to these practices so that they can avoid co-option. I totally agree with this idea, and I love the way you talk about the TT as providing opportunities for the spaces to be dived into, while constantly moving in different directions simultaneously. Maybe my problem is that in trying to articulate what this form might look like, I’m too caught up in searching for a pre-established discourse or rhetoric that doesn’t exist, and maybe we don’t want it to. Perhaps we should focus on articulating not what this container might look like (though I can’t help but be excited by it) but instead what practices and activities can we partake in to find ourselves more frequently arriving in those (in-between) spaces. I’ve also been thinking of a few other instances where an ‘alternative’ approach was taken to education. Red76′s project the “laundry lecture series” comes to mind (http://www.red76.com/salem.html ). These seems like a good example of what a “guerrilla” or “tactical” educator might do. I’m not really sure quite how to talk about it yet… though it gets me excited about concrete moments when these things converge. I suppose it’s possible that the idea cold be pushed further — the laundry lecture series still follow a certain protocol of educational structure — a lecture, a Q&A, etc… What would happen if this type of informal exchange became commonplace — what if every morning on the train a group of commuters recited poetry? or what if we made zines with excerpts of society of the spectacle and passed them out in times square? I wonder what you guys think of this type of project(s)…?? The more I think about it, it seems the moments when these things converge are these moments of educational tactics — so perhaps an appropriate directorship would be of tactical education. What do you think? does Dept. for the Investigation of Tactical Education (DITE) have a nice ring to it? I’m excited to dive into some of these readings, and a summit on these topics would be very exciting! and I agree Jeremy that this is a great conversation, I think others would get something out of reading it on the TT site. look forward to hearing more! This entry was posted in Uncategorized and tagged activism, art, education on November 6, 2007 by admin. 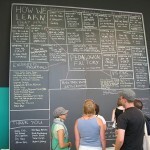 How We Develop a Critical Reader on a Topic of Great Importance was a project developed as part of “Pedagogical Factory: Exploring Strategies for an Educated City” at the Hyde Park Art Center in the late summer of 2007. 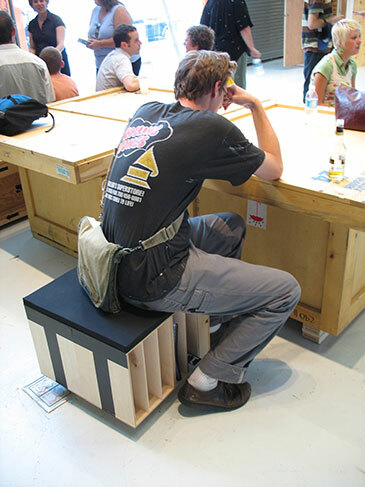 We prototyped a small-scale, mobile bench and library to house our Reader Series, which could be deployed in various contexts to support arts education. This project was conceived of by Jeremy Beaudry and Meredith Warner. The Think Tank that is yet to be named was invited to participate in “Pedagogical Factory: Exploring Strategies for an Educated City” at the Hyde Park Art Center, organized by Jim Duignan of the Stockyard Institute (and realized with the help of many others). Working with other artists, collaboratives, and groups, the project will transform the gallery space into a temporary factory that will design and implement an extensive series of programs and events throughout the two month project. From this collaborative stage, “Pedagogical Factory” will interrogate the overlap between education, economics, art, and activism, creating a venue to explore alternatives to traditional notions of education and social art. 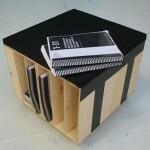 For the exhibition, the Think Tank created a Prototype for a Pedagogical Furniture to contain and present Volume I and Volume II of the Think Tank’s reader series. 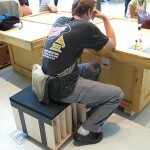 As a prototype, the piece begins an exploration of small-scale, mobile furniture which might be deployed in various contexts to assist arts education. The readers were offered as an example of sustained, critically-focused compilations of texts which might lead the reader along a course of study. This entry was posted in Projects and tagged education, pedagogy, readers on July 24, 2007 by admin. 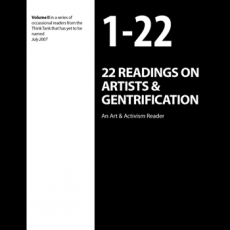 22 Readings on Artists & Gentrification was was developed as Volume II of the Think Tank's reader series in July 2007. It interogates our understanding of our relationship to the place where we live and the effect we (un)intentionally have on those place because of our role as artists, activists, and citizens. This reader was compiled by Meredith Warner, Jeremy Beaudry, and Lena Helen. 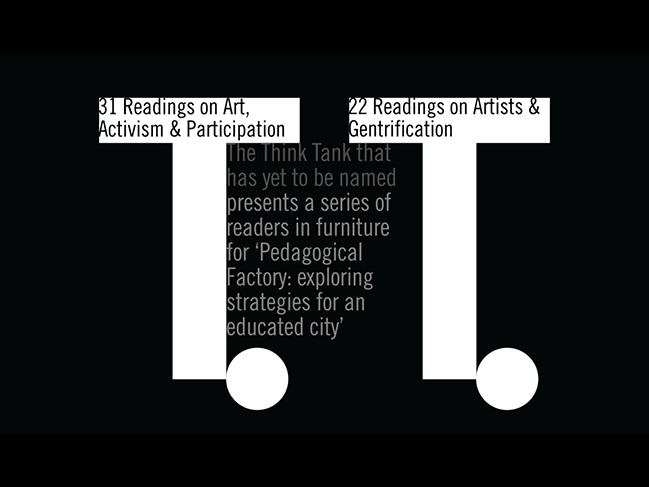 Volume II in the Think Tank’s reader series compiles several texts which discuss issues related to artists, gentrification, the urban environment, and the so-called creative class. These issues are important to our understanding of our relationship to the place where we live (Philadelphia) and the effect we (un)intentionally have on this place as artists, activists, and citizens. This entry was posted in Projects, Readers and tagged art, education, gentrification, politics, readers, urbanism on July 18, 2007 by admin. 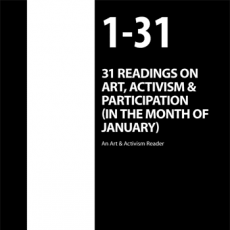 31 Readings on Art, Activism & Participation was developed as the first volume of the Think Tank's reader series in January of 2007. The texts compiled discuss issues of activism and participation in contemporary art practices. It was compiled by Meredith Warner and Jeremy Beaudry. This reader compiles several texts which discuss issues of activism and participation in contemporary art practices. As artists and activists, these issues are important to our understanding and development of our art practices vis-a-vis our involvement in the communities we live in. As the inaugural edition of the Think Tank’s reader series, we read an article a day during the month of January, organically making our way from one text to the next in an investigation of why we do what we do. We created this first reader as a resource for others who are interested in exploring these issues. We participate in the Academy, both as students and educators, and we have some nagging questions: What is the state of (art) education today? How much does a college education cost? Who has access to it? Who doesn’t? Who controls it? What is being taught? How do the economic models that institutions rely on affect affect students, teachers, and critical inquiry in general? How are conventional pedagogical models beholden to notions of “careerism,” “expertise,” and “specialization?” How is a college degree really valued? A poster of notable excerpts from each of the 31 readings is also available. This entry was posted in Projects, Readers and tagged activism, art, community, education, gentrification, politics, readers, urbanism on February 16, 2007 by admin. The Think Tank that has yet to be named initiates research, conversations, and actions that explore contemporary sociopolitical issues in the places where we encounter them. Add your email address to our mailing list to receive occasional updates on projects, publications, and events.